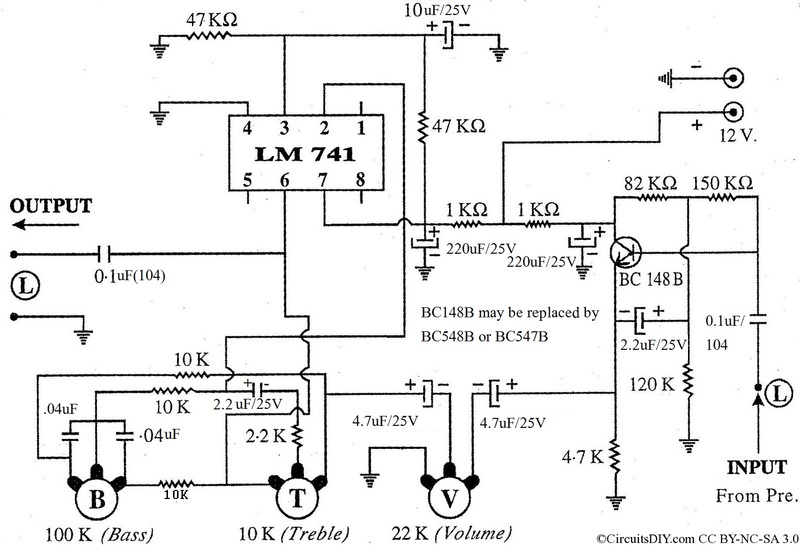 This simple but powerful bass, treble, volume control is made by General Op-Amp IC LM741. The input voltage is 12V, but it will also work with 9V and 6V. This has inbuilt pre-amplifier also. Left channel is shown. Right channel is same. have a dual 4440 ic circuit board of dvd player but i want to make it a amplifire the total circuit is complete but i am confuse with bass and volume wiring. I have one amplifier having IC LA 4440 double channel in bridge mode. My question is whenever i increase bass in full volume the output is low . Please advise. The BC148 transistor is acting as a pre-amplifier, it’s amplified output is fed to the op-amp’s inverting input(pin 2) through a 2 stage RC filter circuit, with some negative feedback from output( pin 6 ). The first RC filter stage is around the volume control, and the second stage is around the bass treble control circuit. The second stage is doing all the magic, it’s going to be a long theory to explain how bass-treble control is working. What is the watts of this circuit? It’s not an audio power amplifier circuit. The output power is expected to be aroubd 500mW peak. I have made your circuit but it’s not giving output to speaker. Also had checked with 4 ohm speaker but same result is there and no voice at speaker. Is there any other power amplifier or preamplifier is needed for this circuit? No pre-amplifier is required but you many need a power amplifier depending on your speaker. But it should work even without a power amplifier, the output volume will be low. There is no single humming in speaker. And can i inquire you on your mail? If you provide me your mail details. The same circuit I made but there is no audio output on 4 ohm speaker. Is there any amplifier for speaker is needed? Or I have to apply another kind of input? Can you please reply me as soon as possible.